The microfiber Haute Couture (composed of 50% polyester and 50% nylon) is a textile that is capable of even more than this. Our knitting yarns consist of hundreds of microfilaments, 100 times finer than hair, which gently clean all materials, removing dirt and collecting dust, trapping them inside the fibres, and preventing them from returning to the surface. Size: 25 x 25 cm. 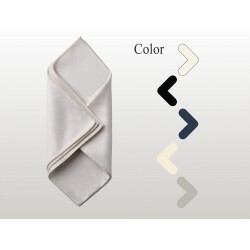 Colours: black, white, ivory, night blue, pearl grey. Composition: 50% polyester / 50% nylon. Uses: polishing, presentation, handling.